Britannia Manufacturing Company of Colchester. The name of the Britannia Sewing Machine Co was changed to The Britannia Co.
c.1880 Commenced producing a gas engine. 1880s Started production of larger industrial lathes. Some particularly large ones were produced by it for James Paxman's business at Hythe Hill. They also manufactured treadle operated drills for dentists. 1893 Built some oil engines which were exhibited at the Royal Show. By 1898 Thomas Bear was a sick man and James Paxman made a bid for his business but this proved unsuccessful. By the early years of the 20th century the firm was in difficulties. 1903 the business was bought by the Nicholson brothers, Victor, Hugh and Percy, who changed its name to The Britannia Engineering Co Ltd. 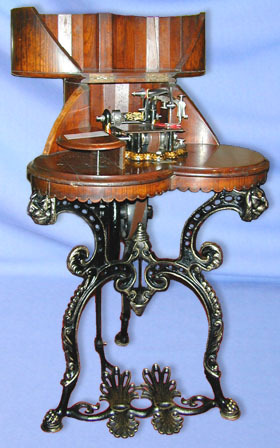 Produced by The Britannia Sewing machine Company, Colchester, England, this highly ornate treadle is one of the UK's most collectable combinations. The machine head is based on the commonly copied Wheeler Wilson rotary shuttle type. This model was manufactured for several years from the late 1860s.